5 minutes on a bus north from Puerto Rico or 5 minutes walk from Balito Beach or Patalavaca and you're at Anfi Beach. You only see the Anfi complex from the street and bus stop but look for the entrance to Anfi Beach complex and there's probably a security guard nearby at the entrance to a path heading down to the sea. Walk behind the secutrity guard and down the path (remember, all beaches here are free/public no matter who puts the sand on it) and there's Anfi beach. 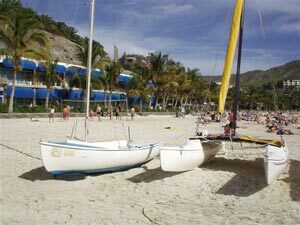 Soft, fine Carribean sand, fantastic watersports and beachside facilities, a trendy shopping arcade and generally/arguably the best beach on the island. It gets packed solid at weekends and during the July and August holidays but well worth the visit whilst you're here. The phrase "Balito Beach" sounds nice, actually the complex itself IS nice but the surrounding area leaves a lot to be desired (or developed!). The beach to the right of the complex in the photo above is a mixture of dark sand, lots of rocks and dirt. There's a shuttle service every hour into Puerto Rico though and you can walk for 10 minutes to Anfi beach which is my favourite at the moment. 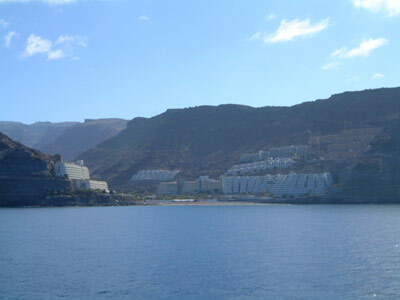 The buildings in the photo above by the way are all part of Balito Beach complex. This is a nice beach! It's not as busy as it would be as the public pool here (called the "Largo") is huge, very impressive and very nice indeed so a lot of people go there insetad. The beach however is soft, black sand. There's plenty of underground parking by the largo and a nice choice of snack-type restaurants and shops a few meters away from the beach. Very nice atmosphere as lots of boats and ships drop anchor around here. 10 minutes past here and viewable in the distance is Mogan. What a suprise - not long ago this was a black-sand beach with plenty of pebbels and a pretty average place but the council have converted the beach and walkway in front into one of THE nicest beach areas on the island. Lovely golden sand, some very good beach-front cafes and restaurants and of course, the atmosphere and views of Puerto de Mogán make this one of my favourite beaches on the island. A highly recommended day out - plan a whole day here and spend the morning wandering around the Marina's streets and shops, go for lunch (have fish!) and then spend the afternoon on the beach. Plenty of sunbeds, loads of towel-on-the-sand space but no sign of watersports (yet?). Bahía de Santa Agueda	As you drive west out of Puerto Rico (direction Maspalomas) and pass through Arguineguin, just before approaching the motorway there's a fork to the right to take you on to the road C812. Going this way for 10 minutes will bring you to the bay of Santa Agueda and several small, not-that-well-discovered beaches. These beaches are known mainly by the locals and few tourists but do get very, very busy Saturday and Sunday as the island's population from the north comes down to enjoy them. The beaches are popular with nudists though each is mixed, "clothes off" isn't essential! The number 32 salcai bus also passes by these beaches though stops are few and far between so you may have a hefty walk to get to the beach you want, best to go by car. As with most of the beaches in this bay, once you see a beach you like it's a case of finding level land next to the road where you can pull off and park. Just past this beach to the left is a place you could park or just before to the right there's space for a couple of cars. 5-10 minutes of pretty easy walking down there from your parked car. The beach is around 300 meters long, mainly sand though gravel further back from the water. The second of the more appealing beaches you come to and this one has a bus stop close by and is also very easy to spot from the road as you drive just a few meters away from it. There's space for about 10 cars to park just past it on the right or space on the left for a lot more right opposite. The beach itself is only about 100 meters long with little sand, mainly gravel. At the end of the beach though there's another 100 meters of flat, more comfortable rocks. Montaña de Arena This beach and the next, Montaña de Arena are my favorites.Not as easy to walk to nor visible from the road makes these beaches more popular with naturalists. Each of them is very sandy and easy to get in and out of the water so popular with families too. As you drive past Los Bigotes, so the part of the bay next to the road, carry on for another 5 minutes but look out for a large, flat area of land to your right about 100 meters back from the road. You'll see it well in advance on it's usually got a fair few cars already parked there. You'll see a track leading from the road to the parking area, there's space there for over a hundred cars. Once parked, head down towards the sea and to the left and you'll find a path that runs along the cliff top going left. Follow this path for 10 minutes of careful walking and you're at the beach. Very sandy beach and the hill behind is all sand too (hence the name, "Mountain of Sand"). Las Carpinteras Much easier to reach than Montaña de Arena but still a hefty walk. The easiest way is to pass the parking for Montaña de Arena and watch out for the next flat area of land to your right, again there'll probably be cars already parked on it. There's a couple of tracks off the road to get to the parking, take either and drive as far away from the road as you dare. The further you go, the worse the track; you'll see what I mean when you get there. Once parked, walk along the path that takes you over the hill and down to the left. At the top of the hill you'll see the beach and the path down to it. If you drove past this parking area for another 1km or so round the next corner, you'll see another dirt track off the road. You won't see the parking area though this track does lead you to it and from there, it's an easy 2 minute walk to the beach. Chances are though you'll miss the turning! Bahía Feliz & San Agustín The first of the many resorts as you head south from the airport, one of the most characterful and less "bed-factory" in appearance too. 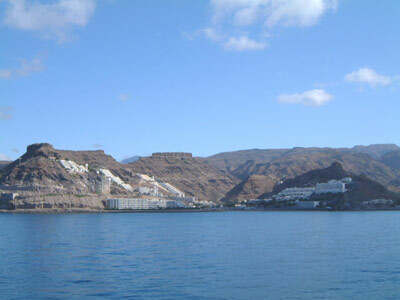 Several gravel/stone beaches and small coves around Bahia Feliz which has a nice "Canarian Village" which is home to a nice choice of restaurants and bars for some snacks and lunch. Adjacent, a 2 minute drive further south is San Agustin. 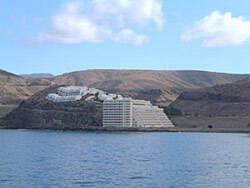 A much bigger resort, less character but some posh hotels and apartments and lots of sandy coastline. Being a larger resort there's lots of restaurants and bars along the beach and a large commercial center to the south. San Agustin has a sea-front promenade running the 7 or 8 kilometers of it's length. Playa de Morro BesudoTake exit 38 off the motorway and follow the initial white signs for Mogan and you'll then see the sign for Bahia Feliz. There's loads of free street parking parallel and adjacent to the beach and it's a simple, 2 minute walk from your parked car. I took these photos on a Sunday, the only real busy day of the week for beaches, hence there's people on it! Normally this is a very quiet, almost deserted beach. It's a rock and gravel beach so not the most comfortable, there's sandy beaches close by to the north and to the south which is why this is a great beach if you want peace and quiet and not many (or any) people around. Playa de San Agustín Quite a long beach, perhaps a couple of kilometers and most of it comfy (dark) sand with some rocky patches in the middle. There are large car-parks at either end, otherwise plenty of free parking along the streets that border the beach. 2 minute easy walk from the car to the beach. Considering this is a main resort, sorry to see no water sports on this beach, you have to head further south a little to Las Burras and Playa del Ingles. Otherwise, good facilities, showers, restaurants, bars and shops all along the beach and a commercial center with lots more packed inside. Worth noting, the medical facilities along this beach are the best on the island so if you have "a condition" and don't want to be too far from help, worry not. As well as a dozen or more medical clinics the island's main private hospital is here too. Las Burras Very nice and popular beach at the very south of San Agustin, the last beach before you hit the beach and dunes at Playa del Ingles. A large car park opposite but a busy road to cross to get to the beach, only 50 meters walking but be careful. At the far end of the beach, maybe a 5-10 minute stroll from the sand is the San Agustin commercial center so a lot of restaurants and bars there for lunch but there's a couple more by the beach itself. Veneguera I should have taken my camera when I went but I didn't. This is the best picture I have and I have no intention of going back there. The beach itself is nice enough, a small wooded area to the left for shade, dark sand and not too many stones and it's quite a large beach too. Week ends and July-August it's very busy with locals but otherwise, a handful of people and popular with naturists. The drive takes you past various farms and banana plantations. Why aren't I going back there then? You'll be driving along a dirt track (which becomes a dry river bed and sometimes not a track at all) at 10kph for a good half hour to get there. One wrong turn and you're stuck so be careful, jeep highly advised. The beach is famous here as developers almost moved in to create a resort big enough to rival Playa del Ingles, developing the entire valley. Locals all around the island convinced the government not to give the go-ahead.